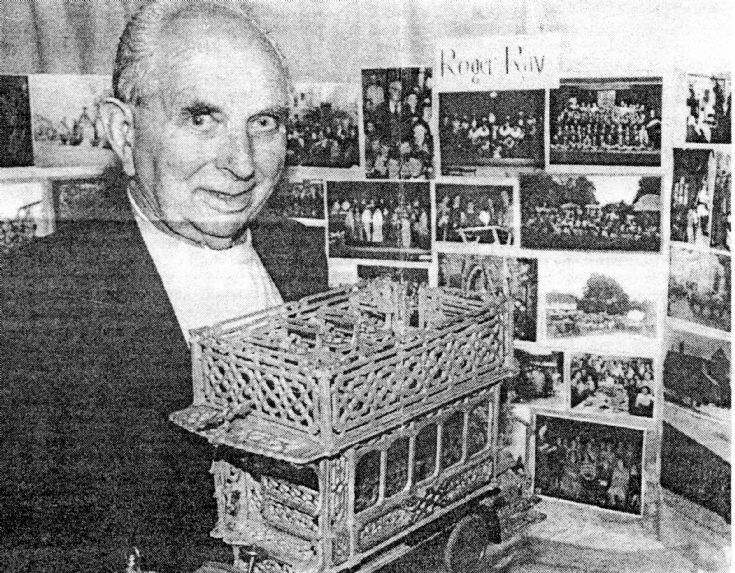 At the 1991 Handcross Summer Show in the recreation ground, Roger Ray displayed a large part of his collection of postcards and other memorabilia of the Slaugham Parish. Also on display was a fretwork model of the bus similar to the Vanguard which crashed on Handcross hill in 1906 killing 10 passengers and injuring many others. The Large Version shows the full newspaper cutting. Select Open Document to view two newspaper cuttings. The first describes a fund-raising event in Handcross Parish Hall towards the forthcoming Silver Jubilee celebrations in 1977. The evening comprised a slide show with commentary by Roger Ray, and featured many items from his postcard and photograph collection. The model of the bus was on display at an exhibition in the Parish Hall to provide funds for the flower show committee. The photograph shows Mrs Maud Arnold and Mrs Joan “Molly” Molineux admiring the model.